In this piece I would like to discuss my practice as a whole, looking to the investigations and themes in my work. Building from the previous instalment I would like to look at how the curiosities, concerns, interests and influences come together guiding and informing my artwork. When talking about art or an artistic practice the first question that generally comes up is ‘What is your art about?’. When faced with this I always think to how the artist Cecile B. Evans describes her approach of boiling it down to a few sentences which she titles her ‘Elevator Line’; a pitch as quick as an elevator ride. I think a lot of artists hate to simplify an entire practice to a few lines. Many of them will argue that the aura in the work is lost through a didactic and definitive statement of intent and I am inclined to agree. Personally I love works that give me space to project into, room to learn as much about myself as the intended investigation or statement, however I also think it’s very important to contextualise, affording people a starting point or a reference point to guide them if they consider it beneficial. My elevator line has chopped and changed along with my practice. Currently the best summary is that my practice investigates Identity by blending experience, memories and contextual reference to examine the multifaceted and nebulous nature of ‘Being’. My practice revolves around these core themes of Identity and Being. It has often investigated them by presenting figurative imagery, bodies and gestures collaged together in a slightly surreal manner intended to form theatrical constructs, a world suspended between the real and the subconscious. Here the influences of artists like Kiki Smith and Ingmar Bergman can be seen, most notably in their use of the body or the actor to portray and investigate more complex themes beyond the body itself, instead examining performative identity, complexities of persona, mortality and physicality. Similarly in my earlier works the body acted as the primary medium for this exploration of metaphysical and ontological ideas. This can be seen in the series The Fragile Nature of Intimacy and Shards of Narcissus. These works utilise the body as the primary image, chopped and layered to create a feeling of unease, the audience never sure if they are looking at a single person or several. In this way the work was intended to speak of the multifaceted nature of the human condition, it’s performative nature and the search for both intimacy and the self somewhere in-between. As my practice developed so too did the elements that became layered into the works. While the body and the figure still stand at the forefront of the visual imagery, they have been blended with academic studies, personal photography and cultural and art historical references abstracted and entwined to further both the message and investigation. In a recent body of work titled Social Topography, featured above, sourced historical maps and photographs as well as personal documentary photography became a key element which referenced the importance of place, looking to social and historical elements as well as landscape on the formation of a local identity. Blending references from various sources in this way has become a key factor in the formation and composition of my images. This can be seen again in more recent works like Pyre which draws further influence from magazine clippings and art historical references. In this way I see the artworks as a delicate balance of layered and coded information. My intention in their creation is to blend social and cultural elements, artefacts and texts in a manner to begin to create a visual dialogue, a web or net of connections forming a proposition or reflection. After looking at the image composition the other recurrent factor in the formation of the work is the McLuhanian concept that “the medium is the message”. In the series The Fragile Nature of Intimacy this became a prominent feature and lead to the development of two aesthetically contrasting bodies of work investigating the same themes. 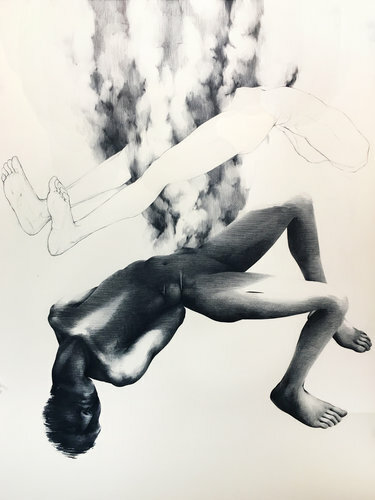 The series juxtaposed the textural and visceral qualities of the hand-printed image against the exacting and loaded visual representation of the body in digital imagery. In this way the two bodies of work were intended to examine the theme of intimacy from two separate angles while in proximity they created a second dialogue which questioned the representational qualities of the image itself, challenging their historical perceptions and underlining the ideological underpinning of the two mediums. As my practice developed this concept took different forms always with the intention to add a further layer to the works. 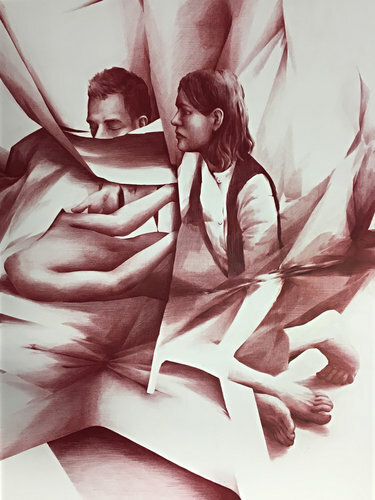 In more recent pieces such as Dowsing the draftsmanship of the image is actively intended to visually seduce the audience by employing an academic pencil style rendering in the work only to reveal it’s depiction as a fabrication, the audience’s eyes caught between the fragmented figuration and the two-dimensional crumpled texture which challenges both the authenticity of the image and it’s representation. Influences like the films of Wong Kar-wai come to mind, It is often said that if Christopher Doyle’s cinematography and the actors weren’t so beautiful that In the Mood for Love would be too dark and harrowing to bear. In the same vein the beauty incorporated in the articulation of this drawing is employed to hide more sinister propositions. I am still exploring the many ways different mediums might be employed or manipulated to add extra meaning to the investigation itself beyond it’s formal qualities. While developing of a new body of work for Invasion/????????? which will launch in Moscow later this month I am exploring layering of paper based images and cutouts, employing the visual collage as an expression the layered nature of a personal identity. In these new works I am trying use physical layering to emphasise the bricolage of Irish social and cultural factors and their intrinsic influence on the development of a personal and cultural identity. Invasion/????????? launches in The Zverev Center of Contemporary Art, Moscow. on 19th March 2018. The gallery will showcase two new bodies of work from artists Aaron Smyth and Valery Korchagin, The exhibition is curated by Alexandra Orlova. In The Shower with Taz and Marcus | Why do Most Black Cats Have a White Spot?